Wiz Khalifa will head out with Fall Out Boy on a 40-plus city “Boys of Zummer” headlining tour, stopping at Jones Beach on June 24. 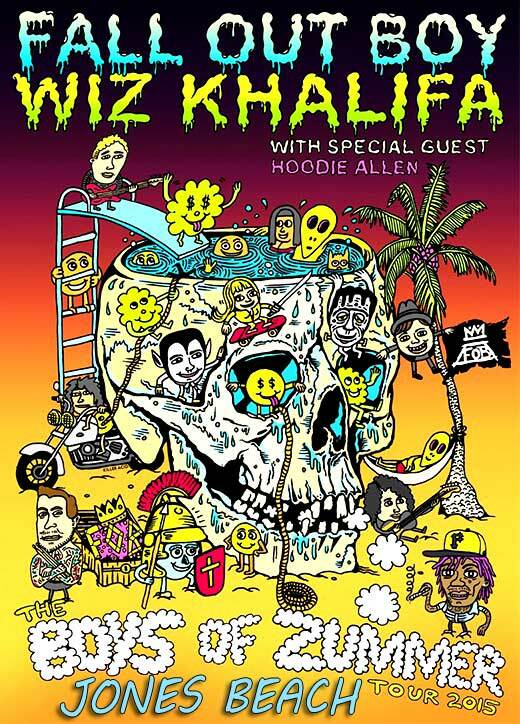 The special guests are rapper/singer Hoodie Allen. Fall Out Boy were punk-pop darlings in the ’00s with tracks like “Sugar, We’re Goin Down” and “This Ain’t a Scene, It’s an Arms Race” before making a comeback in 2013 with “My Songs Know What You Did in the Dark (Light Em Up).” Patrick Stump, Pete Wentz and company are releasing their sixth studio album, “American Beauty/American Psycho,” next week. And rapper Hoodie Allen built a following through his mixtapes before dropping his major label debut “People Keep Talking” last fall, featuring a collaboration with Ed Sheeran.